More than 20 years ago, the City of Chelsea re-built their school district – literally. The district, located just outside Boston, decided to build nine school buildings at one time. Today, they cautiously manage their portfolio of simultaneously aging facilities, while carefully allocating resources to keep the district in working order. One of the school buildings, the John Silber Early Learning Center, was so damaged that not only moisture, but melting tar was infiltrating the deteriorated roof deck. The existing retrofit EPDM roof assembly was leaking badly. Chelsea Public Schools Director of Facilities and Construction, Joe Cooney, knew something had to be done but quotes to replace the 30,000-sq. ft. roof were too costly. He reached out to his local Garland Company, Inc. representative, Brendan Wall, for another proposal. To start, Wall completed an infrared scan of the entire roof area. The scan was able to show areas of wet insulation below the roof surface. Based on the results, Wall proposed a plan to replace the worst roof section and then repair the elevations that could be saved. “The Garland solution made this project possible, it was a huge savings,” Cooney said. One 5,000-sq. ft. section of the roof was identified for complete replacement down to the deck. The roof was torn off and re-built completely. The new system was capped off with Garland’s polyurethane-modified asphalt-based membrane, OptiMax®, one of the longest lasting membranes available on the market. 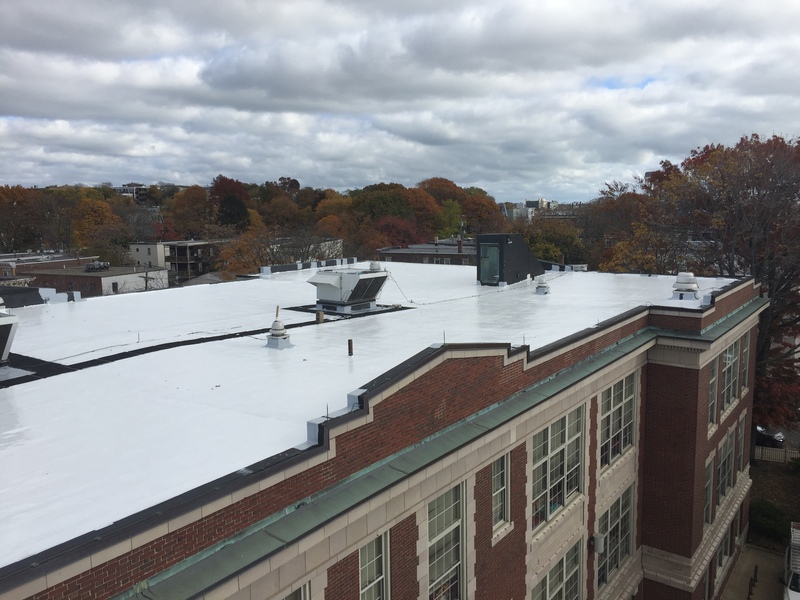 To minimize odor and VOC’s on the school project, crews used Garland Weatherking® cold-process adhesive to install the system. For the remaining 25,000 sq. ft., Wall prescribed new insulation and repairs where required to the existing system before adding a high-performance restoration coating. Garland White-Knight® Plus was applied to the roof to restore the aged surface as we ll as add a layer of UV-protection and chemical resistance to protect the roof for years to come. 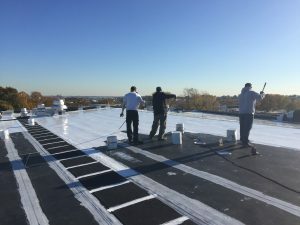 White-Knight Plus – a bright white, urethane waterproofing membrane – also keeps the rooftop temperatures cooler (which had been a problem with the previous system). “With White-Knight Plus, we don’t have the same issues with high temperatures, so that has cured a lot of problems at once,” Cooney said. Crews coordinated with the school staff to complete the work in a safe and timely fashion, accommodating the young pre-Kindergarten and Kindergarten students who were in session during the project. And the students are now learning in a safer, dryer environment. The building has been leak-free since completion, even enduring a very wet, snowy winter right after completion. “Everyone is happy with the project, Brendan was really excellent. He was so visible, he was everywhere.” Cooney said. The Chelsea School District is already planning another building envelope project with Wall at another school down the road. See the complete highlight here.